The TRUSTED Representatives have been busy meeting with businesses all over the city , and we have already sold out of a few categories ( pending verification) , the feedback has been great and we are excited to announce the next 4 businesses that will be soon uploaded onto the site as they have all passed the reference checks and the full in depth verification procedure. We are thrilled to announce that the first Trusted Salon on www.trustedsaskatoon.com is The Hairstyle Inn and they were on our hit list of salons to get on board as a partner from day 1 when we discussed this category in Saskatoon. The Hairstyle Inn have 2 great locations in Saskatoon in the Mall at Lawson Heights and most recently at The Centre Mall on 8th street, and they have an extremely loyal following in the city. When we did the survey their clients were extremely happy with their services and felt very lucky to have found them. Laddie and Shelley head up an extremely impressive team and their credentials really do speak for them selves. We look forward to telling you about our other new advertsing partners in the next day or two...in the meantime if you know of any Great businesses in Saskatoon or any other city across the country , please let us know...Trusted believe that Great businesses DESERVE recognition! We are pleased to introduce you to TrustedSaskatoon.com latest Trusted businesses. Congratulations to Palliser Rooms / EQ3 and Superior AutoBody...both businesses passed the verification and checking procedure with ease, Palliser EQ3 listing is live click here to view and the Superior will soon be uploaded onto www.trustedsaskatoon.com , let us tell you a little more about them! Palliser /EQ3 is a beautiful Furniture store situated on Faithfull Avenue,Saskatoon..there are many reasons why it was one of the first businesses to be approached by Trusted Saskatoon..here are just a few: Tristan and the rest of the team make you feel very welcome and they are extremely helpful .....with out being pushy. Once you have stepped inside you will see why this store attracts a very loyal following in the city...contemporary, well cafted furniture that can be personalised to your specifications, and the store itself is designed and laid out beautifully. To have a preview of the items available, why not browse their web site or go to their facebook page and join the other 1200 fans of the store who hear about offers and new items before anyone else! Superior Auto Body was established in 1961 by Monty Heiser's ( the current owner) Father..and has always been in the same location on Ave Q south. Superior go out of their way to do the best job for their clients..and if you go into their office ..just look to your left on the wall behind the glass ..there you will see lots of letters and cards of thanks from their clients going back years...1 elderly lady who left a particularlly nice handwritten note, even brought in a tip of $20 to be shared between the ' boys who looked after her so well, and got her car fixed up nicely' . It's the small stuff that matters, and they do it so well...no one likes to be dealing with an accident, but if you are caught in that prediciment Trusted would definitley recommend Superior Auto Body as a great choice. 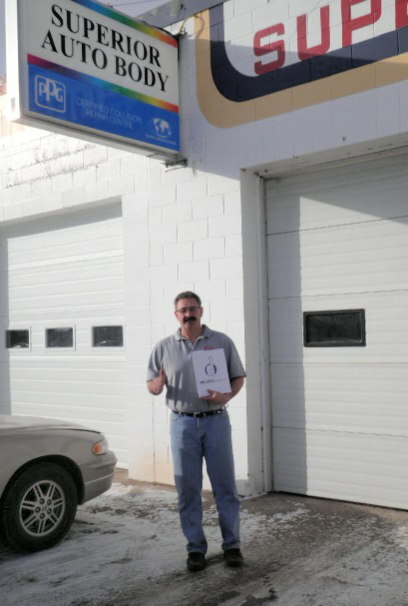 Heres a picture of Monty giving the 'Thumbs up' outside Superior auto Body! Don't forget ....we want YOUR Nominations for businesses in Saskatoon...and across Canada...our data base of recommended prospects is growing daily! First Trusted Saskatoon listing is live! www.trustedsaskatoon.com is thrilled to have our first trusted listing Marla Janzen , pictured here giving us the thumb up outside Century 21 Conexus Realty . Marla passed the verification process with flying colors, all of her clients surveyed strongly agreed that she deeply cares about her clients and she is extremely professional...they all would ( and most have) recommended her to close friends and family members..just the kind of person that Trusted looks to partner with. Click here to view her listing. The Trusted team have completed more verifications and will be uploading more TRUSTED Saskatoon businesses onto www.trustedsaskatoon.com each week, and we will be introducing you to more trusted businesses here soon...so watch this space. If you know businesses that fall into our categories in Saskatoon that you would highly recommend please go to the 'contact us' section on the website and NOMINATE them..good businesses deserve recognition and we would love to hear from you! Trustedsaskatoon.com is a big hit with quality driven local businesses! The Trusted representatives have been out in our home city of Saskatoon since the city website www.trustedsaskatoon.com went live on the 18th January. We have been meeting with pre selected businesses in Saskatoon to talk to them about Trusted and the feedback has been all positive! On that note, Trusted is please to announce that our first uploads onto the site are happening next week, starting with our first Trusted Realtor Marla Janzen of Century 21 Conexus Realty. Marlas listing will be uploaded next week ,and we will post her bio here on the blog for all to read. You will see exactly why we contacted her to be one of our three Trusted realtors here in Saskatoon! The Trusted representatives are going to be very busy meeting with potential business partners in Saskatoon, but we are NEVER too busy to hear about great businesses that have been recommended by YOU ...their clients and contacts ....so please let us know if there are any Saskatoon businesses you think we should be contacting...it's easy..just go to the Contact Us section on our websites and click on NOMINATE A BUSINESS....taking a few minutes of your time to tell us about a good business is time well spent....we all know that word of mouth is the best form of advertising, all trusted does is amplify that word of mouth! Trusted goes LIVE on the world wide web!! www.trustedcanada.com is the Trusted families national site whos job is to showcase the Trusted Philosophy to Canada, as we carefully make our way across the country city by city...everything announced here will be shared with our city satellite sites, and those of you wishing to nominate businesses in your cities, either in cities we have reached...or ones we haven't got to yet, PLEASE contact us..we really DO value word of mouth recommendation above all other advertising...what Trusted does is simply make the word of mouth travel faster for the outstanding businesses that we partner with..thereby benefitting consumers as excellence is rewarded and standards are aplauded! We are in Saskatoon meeting with pre selected, refererred and nominated businesses for www.trustedsaskatoon.com right now, and we will keep you updated, as we research, contact and qualify our first cities Trusted businesses.....we have already had a wonderful response and this will be the first place we will post the Trusted companies details, pictures and BIO's. "Trusted....The Smart & Simple Choice! "